The front door of Mark and Laura Rogers’ home in Clyde opens to some 250 acres of picturesque forest and farmland, rolling hills, and a clear view of Crabtree Bald. Five generations of the Rogers family have protected this pastoral landscape since the 1850s, when Asbury Rogers, Mark’s great-great-grandfather and a Confederate captain during the Civil War, settled in Haywood County. 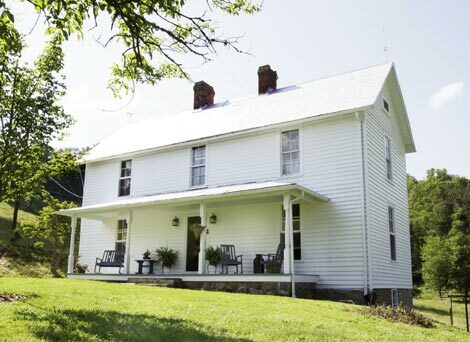 Though Asbury’s log cabin was taken down some years ago, the two-story farmhouse of his much-younger widow, Lorena, received a fresh revamp when Mark and Laura bought it in 2010. Mark had grown up across the field raising cattle on his father’s property, another 250-acre farm. “I’ve just had a soft spot for this place all my life,” Mark says. Another motivating factor in purchasing the homestead was their concern that a buyer would develop the land, which last belonged to Mark’s uncle. “We just wanted to keep it in the family,” Laura says. The couple spent seven months renovating the gable-roofed, vernacular farmhouse, which dates to 1890, keeping the original clapboard siding and windows throughout. The Rogerses tackled much of the work themselves while raising 60 head of beef cattle and holding full-time jobs. Mark is an engineer at Evergreen Packaging and Laura teaches French and Spanish at Tuscola High School in Waynesville. “That first year, I focused totally on the house and let my farm work go by the wayside. Luckily, my dad, who I’m farming with, was able to pick things up,” Mark says. The goal was to preserve the home’s 19th-century charm both in their renovations and design choices. “We wanted to embellish the house but also keep it as it was—to modernize it without making it look modern,” Laura says. The first priority was expanding the living space beyond the three rooms—kitchen, den, and bedroom—that Mark’s aunt and uncle had heated with kerosene. The couple played musical rooms as they reimagined the floor plan: The bedroom turned into the den, the dining room is now a sitting room, and the formal parlor transformed into the master bedroom. Perhaps the biggest transformation was converting the enclosed side porch that had been used as a laundry into a dining room fit for large family gatherings. The sun-filled room holds two seating areas, with a mason jar chandelier made by Mark anchoring the main table, which was salvaged from the basement and refinished. A teal and brown palette warms the room, and oriental rugs carry the hues throughout the house. The buffet is an antique from Belgium, where Laura spent time as a child. The teal carries over to the wood-plank kitchen walls, which Laura sanded and painted. She resurfaced and installed the white cabinets, and chose appliances appropriate for the age of the house, including a vintage-style refrigerator and stove. The window above the enamel sink frames a view of one of the barns and a silo, with hills rising just beyond. While sprucing up the master bedroom, the Rogerses got a 120-year-old surprise: The floral wallpaper, which also covered the ceiling, was glued to a layer of muslin that had been nailed to the walls. Stripping the paper and sanding away tiny fabric threads caught on the nails took Mark three weeks. He topped off the revamp by installing a shiny, tin ceiling. “He can do just about anything,” Laura says. Adapting to the quirks of an 1890 home was also a challenge. Because there are no closets, the couple pared down their possessions and stored items they wanted to save for their two grown sons in the barn. Two sturdy hooks serve as Mark’s wardrobe, and Laura uses an armoire. Some furnishings had to be shimmed to custom fit the house. “The floors are so uneven that the drawers of a dresser would fall out,” Laura explains. The electrical wiring throughout the house was an upgrade they left to contractors, along with adding outlets, as there was only one upstairs. In the attic, still home to heirlooms such as daguerreotype portraits of Asbury and Lorena, spinning wheels, and a rope bed, the Rogerses discovered the original antique carbide lights, introduced to American homes in the mid-1890s. The couple also spent their off hours caulking, sanding, fixing barn roofs, stripping lead-based paints, repainting inside and out, and redoing the plumbing and fencing around the property. The goal was to move in by the fall: They settled in three days before Christmas.